The MOSSAR Color Guard Team participated in presenting and retirement of the colors during the Wreaths Across America Ceremony on December 11, 2010. 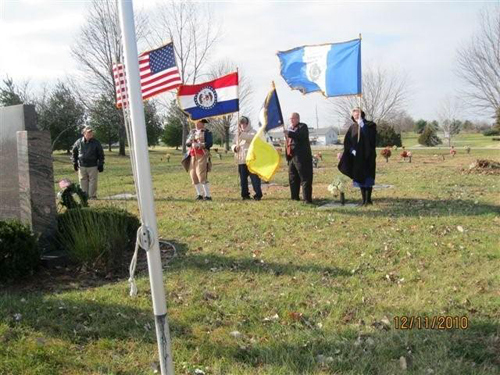 The team participated in the Wreaths Across America Ceremony located at the Swan Lake Memorial Gardens Cemetery in Grain Valley, MO, which honors Missouri veterans. The MOSSAR Color Guard team was privileged to meet Colonel Don "Doc" Ballard, Congressional Medal of Honor Recipient after the Wreaths Across America Ceremony. Colonel "Doc" Ballard, is the owner of that cemetery. Donald E. Ballard, US Navy, was presented the Congressional Medal of Honor Recipient, for conspicuous gallantry and intrepidity at the risk of his life and beyond the call of duty while serving as a HC2c. with Company M, in connection with operations against enemy aggressor forces. During the afternoon hours, Company M was moving to join the remainder of the 3d Battalion in Quang Tri Province. After treating and evacuating 2 heat casualties, HC2c. Ballard was returning to his platoon from the evacuation landing zone when the company was ambushed by a North Vietnamese Army unit employing automatic weapons and mortars, and sustained numerous casualties. Observing a wounded marine, HC2c. Ballard unhesitatingly moved across the fire swept terrain to the injured man and swiftly rendered medical assistance to his comrade. HC2c. Ballard then directed 4 marines to carry the casualty to a position of relative safety. As the 4 men prepared to move the wounded marine, an enemy soldier suddenly left his concealed position and, after hurling a hand grenade which landed near the casualty, commenced firing upon the small group of men. Instantly shouting a warning to the marines, HC2c. Ballard fearlessly threw himself upon the lethal explosive device to protect his comrades from the deadly blast. When the grenade failed to detonate, he calmly arose from his dangerous position and resolutely continued his determined efforts in treating other marine casualties. HC2c. Ballard's heroic actions and selfless concern for the welfare of his companions served to inspire all who observed him and prevented possible injury or death to his fellow marines. His courage, daring initiative, and unwavering devotion to duty in the face of extreme personal danger, sustain and enhance the finest traditions of the U.S. Naval Service. 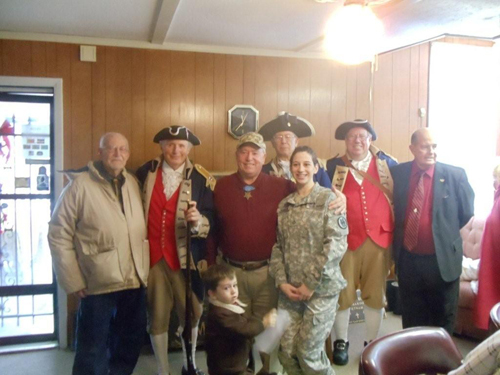 Right Photo (L-R): Ken Crabtree, Captain Al Paris, Colonel "Doc" Ballard, Congressional Medal of Honor Recipient; Major General Robert L. Grover, MOSSAR Color Guard Commander; Captain James L. Scott, and Eldon L. Allen.